Define mechanisms for the generation, maintenance and functional heterogeneity of human tissue-resident versus circulating lymphocyte populations. Identify networks for lymphocyte migration, maintenance and homeostasis by analysis of clonal organization and diversity in tissues and circulation. 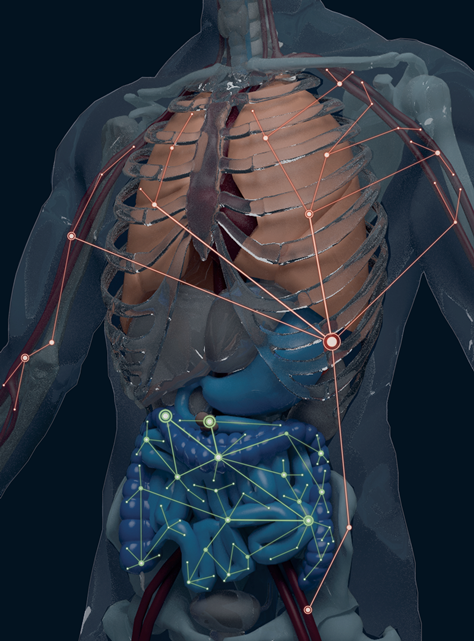 Generate a baseline of immune health for understanding tissue pathologies in disease. The three projects and four cores that comprise this research program are described in the schematic figure and in detail below. T lymphocytes coordinate all aspects of adaptive immunity throughout the body, with memory T cells representing the predominant subset that populates multiple tissue sites. We and others previously identified a subset of non-circulating tissue resident memory CD4+ and CD8+T cells (TRM) in mouse mucosal and barrier sites that are generated following infection, specifically retained in tissues and mediate optimal protective responses in situ. TRM can also be generated to vaccines, tumors, allergens and autoantigens, indicating the potential importance of this key subset in immune protection and immunopathology. Our central hypothesis is that TRM generation is determined both by T cell-intrinsic differentiation and the tissue site, which adapts them for long-term persistence through transcriptional regulation and epigenetic changes. We propose in Project 1 to elucidate mechanisms for how TRM cells in diverse sites differ from those in circulation, including their generation, maintenance and heterogeneity through epigenetic, transcriptional and ex vivo func profiling on the population and single cell level. We will also use imaging approaches to dissect how TRM localization impacts function and persistence. PIs: Mark J. Shlomchik, M.D., Ph.D. and Nina Luning Prak, M.D., Ph.D.
B cells play critical roles in vaccine-induced immunity, pathogen resistance and clearance, autoimmunity, resistance of tumors to immunotherapy, allergies, and even rejection of transplanted organs. Memory B cells (MBC) are generated from an initial antigen exposure and mediate critical effector, antibody-secreting and protective functions. MBC are important for the efficacy of many vaccines and also have critical roles in sustaining autoimmunity. The tissue distribution of memory B cells in either humans or mice is not well characterized, and remains much less studied compared to memory T cells. Project 2 is led by Drs. Mark Shlomchik at the University of Pittsburgh, and Dr. Eline Luning Prak, at the University of Pennsylvania. They are breaking new ground in defining new subsets of memory B cells in humans, based on surface markers, functional potential and transcriptional profiles, and is also defining now networks of B cell clones are distributed throughout the body and identifying novel specificities for large B cells clones. Understanding tissue-based immune responses is of central importance in developing improved therapies to enable long-term allograft survival—particularly with mucosal transplants with substantial resident immune cells. This ongoing project on intestinal transplantation (ITx) enables a temporal analysis of in situ responses in the context of ongoing host-versus graft (HvG) and graft-versus-host (GvH) responses. Clinical monitoring occurs through direct sampling through biopsies. Project 3 is led by Dr. Megan Sykes at Columbia University. Her team will determine the functional and spatial regulation of alloreactive T cell responses in the graft, circulation and bone marrow, and will also assess the homeostasis, specificity and genesis of B cell responses in the graft, bone marrow and circulation. Results from this project will lead to new insights on tissue immune responses in transplantation. PI: Donna L. Farber, Ph.D.; Co-I: Tomoaki Kato, M.D. Core B will provide all human samples to be used in all the projects including organ donor tissues and cell samples for Projects 1 and 2, and blood and biopsy samples from intestinal transplant patients for Project 3. P.I. : Peter Sims, Ph.D.; Nina Luning Prak, M.D., Ph.D. Core C provides essential assays for profiling human lymphocytes in tissue sites. Dr. Peter Sims, in the Department of Systems Biology at Columbia University will provide assays for low-input, bulk RNA-Seq and ATAC-Seq (assay for transposase-accessible chromatin plus high-throughput sequencing) as well as single-cell RNA-Seq with both high-throughput microfluidics and low-throughput plate-based whole transcriptome amplification. Dr. Nina Luning Prak at University of Pennsylvania will perform high-throughput TCR and antibody repertoire profiling, using established platforms optimized by her team. P.I.s: Yufeng Shen, Ph.D. and Uri Hershberg, Ph.D. The bioinformatics and database management core is led by Dr. Yufeng Shen in the Department of Systems Biology at Columbia University and Dr. Uri Hershberg, at Drexel University. The role of this core is to analyze, interpret and integrate the large datasets to be obtained from this program, and curate and organize these data for sharing with research community using public databases such as ImmPort and Geo. Specifically, the core will analyze bulk and single cell RNA-Seq data, based on robust computational pipelines, and will analyze B cell receptor (BCR) and T cell receptor (TCR) repertoire using the ImmuneDB platform, developed by Dr. Hershberg.